Leigh Nicholson checks out Marvel’s first female, Muslim superhero. For the longest time, Marvel has tried to mould their characters and comics to fit with the people reading them. Their heroes rise out of teenage and isolated angst. The creators of the new Ms. Marvel, Kamala Khan, have truly reinvented the character: a 16 year old girl, first generation American, coming from a relatively strict Pakistani family. She is the first female, Muslim character in the Marvel universe to have her own leading role in a comic book. The new Ms. Marvel is part of the ‘Characters and Creators’ initiative that Marvel is implementing to draw focus to female protagonists and writers. Other re-booted heroes for this campaign include Elektra, She-Hulk, and an all-female X-Men team. Marvel was slow to introduce female superheroes in the 1960s and 1970s, and even then, they were arguably written as straw feminists. The contemporary publishers wanted to be part of wider initiative to demonstrate, as Marvel’s editor-in-chief Axel Alonso put it, that comic books are no longer a ‘boys’ club’. To that end, Marvel have introduced a lead female character from a Muslim background in an industry which stillhas quotes seeping out about the un-American evolution of comic book characters. Despite all this, Sana Amanat, the Pakistani-American editor behind the comic book, is emphatic that Khan’s character demonstrates the same concerns almost every Marvel character faces. “She’s a teenager and she’s struggling to find her own path,” Amanat told The Washington Post. The first instalment successfully pays homage to this recurring theme, whilst also exploring the conflicts and stresses which Khan faces, growing up under her comparatively strict Muslim parents. Before sneaking out to a party against her parents’ wishes, Khan summarises her annoyance, saying, “It’s just one party … it’s not like I’m asking their permission to snort cocaine”. Captain America shames Khan for turning her back on her parents, saying “You thought that if you disobeyed your parents, your culture, your religion; your classmates would accept you”. The original Ms. Marvel, Carol Danvers, first appeared in 1968 and was probably the comic book publisher’s first serious response to the feminist movement. Danver, outside her heroine-status, was the editor of Women Magazine. She insisted on the title of “Ms.” and constantly rebuffed the chauvinism of Tony Stark upon her joining the Avengers. There were still problematic components of Danver’s storyline, including her appearance and costume, but for the most part she was an enduring and noteworthy character. She moved to the ranks of Captain Marvel, and passed on the legacy of Ms. Marvel to Khan. When Danver asks who she wants to be, Khan replies, “I want to be you”. This initiative by Marvel is supposed to push some of the existing female superheroes into their own leading comics, and address other aspects of depiction, which were the result of comic books being a male-dominated field. The original costume for Danver’s Ms. Marvel consisted of a confusing array of short pieces and exposed midriff, but somehow justified the need for a scarf. When Khan tells Danver (now Captain Marvel) that she would “wear the classic, politically incorrect costume”, Captain Marvel replies “you must have some kind of weird boot fetish”, taking a stab at her creators and her history. Khan is a character a lot of Marvel’s readers can relate to. She gets frustrated at her parents’ control, and she gets excited about Avengers fan fiction. 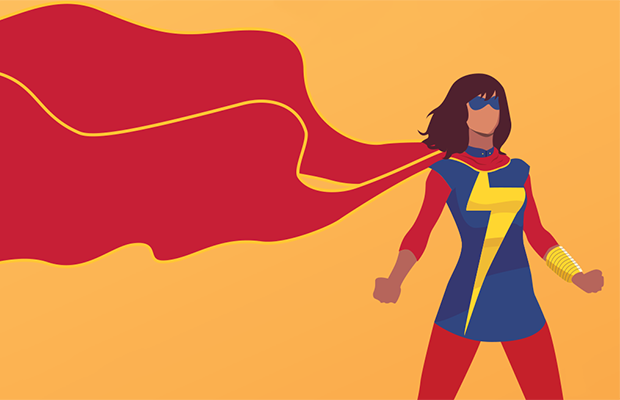 Pakistani-American journalist, Sabaa Tahir, wrote when reviewing Ms. Marvel that, “at age 10, or even 15, it would have meant the world to me to see a Pakistani girl portrayed positively”. Kamala Khan is going to mean different things to different people, but will hopefully be enjoyed by all members of the comic book community.